Last night, gold traded in a range $1194.20 - $1201, largely moving against the direction of the US dollar. During Asian hours, gold slumped to its low of $1194.30 as the DX rose to 94.37, but was supported ahead of the quadruple bottom at $1192-93 (9/12, 9/14, 9/17, and 9/21 lows). Later during European time, gold bounced to its $1201 high, as the DX softened to 94.05. The dollar was pressured by strength in the euro ($1.1725 - $1.1775, stronger German IFO reading) and sterling ($1.3062 - $1.3160, UK Brexit Secretary Raab was optimistic on getting a good Brexit deal). Global equities were weaker and gold supportive as China canceled planned trade talks with the US, and the newest tariffs between the countries took effect overnight. The NIKKEI and SCI were both closed, European markets were off from 0.2% to 0.3%, and S&P futures were -0.2%. A spike higher in oil (WTI to $72.39) as OPEC failed to boost output – despite demands from Trump – were supportive of stocks. At 8:30 AM, a lower than expected reading on the Chicago Fed National Activity Index (0.18 vs. exp .20) pressed S&P futures further down (-7 to 2926), and took the US 10-year bond yield down from 3.08% to 3.068%. 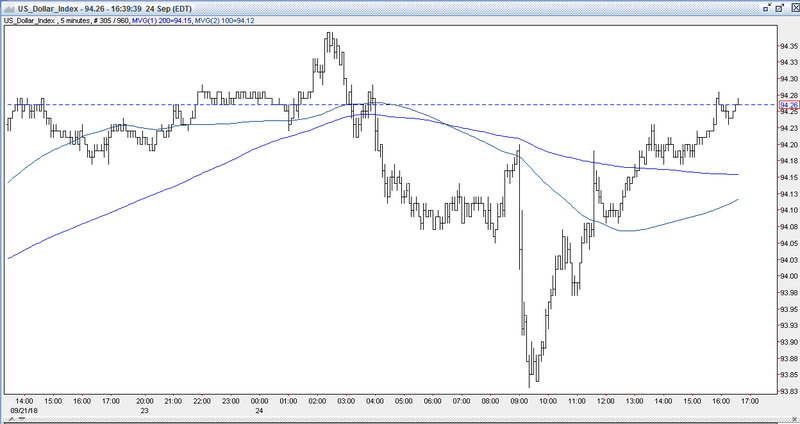 The DX, however, bounced to 94.20, ahead of some remarks by the usually dovish Draghi. Gold was tugged down in response and dipped to $1198. At 9AM, Draghi was surprisingly a bit hawkish (cited shortages in some sectors, pick up in wages, projects core inflation reaching 1.8% in 2020). 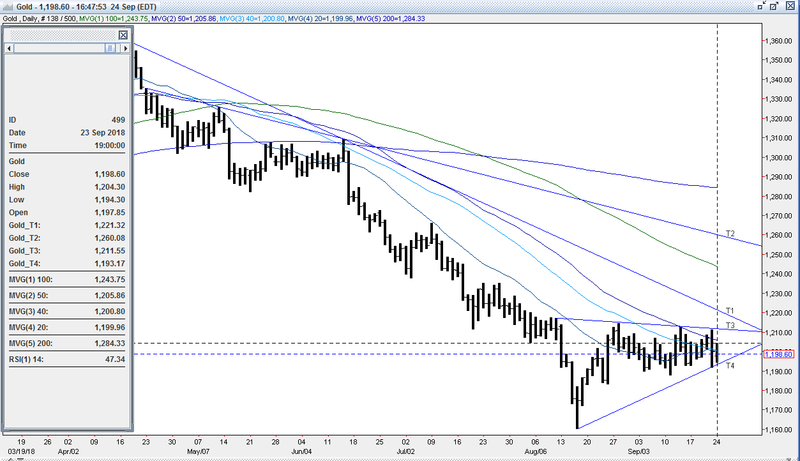 The euro shot to $1.1815 (3-month high), and the DX tumbled to 93.83 – finding support ahead of Friday’s 93.81 low. 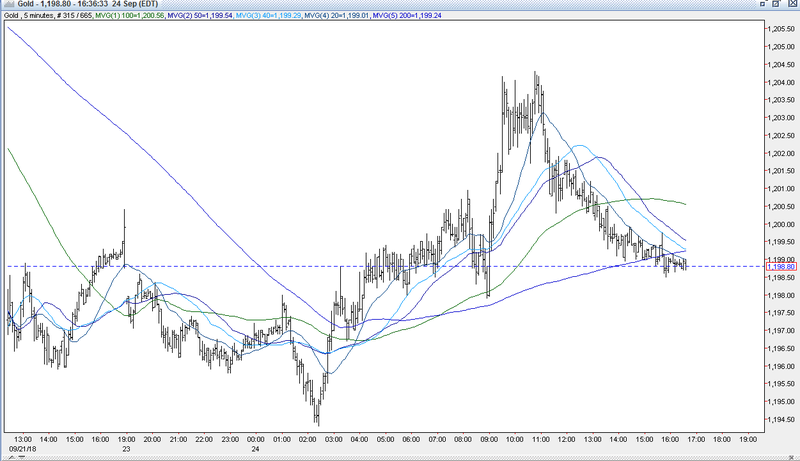 Gold pushed higher and tripped some light buy stops beyond the overnight high to reach $1203.90. Around 10:30 AM, reports that the embattled Deputy Attorney General Rod Rosenstein had resigned pushed US stocks further down (S&P -16 to 2913), with consumer staples, materials, and real estate sectors getting hammered. The US 10-year yield - which had rebounded to 3.091% - sank back to 3.065%. The DX - which had recovered to 94.07 – fell back to 93.97. Gold, after dipping to $1202 rallied back to a fresh high at $1204.30. Into the afternoon, US stocks made a modest rebound on news that Rosenstein didn’t resign or was fired, but would be meeting with Trump this Thursday. The S&P finished -10 to 2929, while the US 10-year bond yield ticked back up to the 3.08% area. The DX recovered to 94.23, and then remained fairly steady between 94.17 – 94.22. Gold slid back to $1198.50 in response and was $1199 bid at 4PM – unchanged. Open interest was up 1.1k contracts, showing a net of new shorts from Friday’s decline. Volume expanded with 358k contracts trading. Some bulls were a bit disappointed that despite the cancellation of US/China trade talks, and the political turmoil surrounding Rod Rosenstein that led to a significant pullback stocks, gold couldn’t manage to hold onto its earlier gains. However, other bulls point out that the uptrend from the $1160 low is still intact, and are encouraged that gold has remained over $1187 – the 50% retracement of up move from the 8/16 $1160 low to the 8/28 $1214 high. Bulls remain steadfast in their thinking that gold bottomed at $1160 on 8/16 after a $35 2-day capitulation, and will look to either add to long positions on weakness, or on some expected ensuing upside momentum. Bulls are looking for gold to consolidate recent gains over $1187 (50% retracement of up move from the 8/16 $1160 low to last week’s $1214 high) and then challenge upside resistance levels at $1212 (down trendline from the 8/10 $1217 high), $1213-14 (triple top – 8/13, 8/28, and 9/13 highs) and then $1216-18 (5 tops, 8/6, 8/7, 8/8, 8/9 and 8/10 highs). Beyond this, bulls are looking for a move to at least $1262 – the 50% retracement of the move down from the 4/11 $1365 high to the 8/16 $1160 low. In addition, bulls maintain that Friday’s Commitment of Traders Report showing the large funds added to their net short position (turned short 4 weeks ago for the first time since 2002) and with a massive gross short position (208k contracts –short side of gold an extremely crowded trade) leaves this market set up in a highly favorable position to move up from potential heavy short covering and sidelined longs returning to the market. Bears have been using gold’s recent bounce off of $1160 to rebuild short positions scale up, and are comfortable to continue to sell into any strength. Many bears believe that gold’s recovery rally ($1160 - $1214) has been completed, and point to its repeated inability to take out the $1214 double top (despite the dollar weakness), as evidence that the yellow metal will resume its decline. This is witnessed by Friday’s COT Report showing the large funds added to their net short position and have with a hefty 208k gross short position. They feel fuel from a rebound in the dollar from its recent correction will provide downside pressure on gold, and that the dollar’s ability to strengthen against other currency majors (and emerging market currencies) still has legs. They will be gunning for stops below initial support at $1193 (triple bottom - 9/12, 9/14, and 9/17 lows, up trendline from 8/16 $1160 low) followed by $1191 (up trendline from 10/19/08 $682 low),$1187-88 (9/11 low, 50% retracement of up move from 8/16 $1160 low to 8/28 $1214 high), and $1183 - 84 (triple bottom - 8/20, 8/23, and 8/24 lows) to lead to a test of $1175 (options strike) and then $1171-73 (quadruple bottom – 8/15, 8/17, 1/6/17 and 1/9/17 lows). All markets will continue to focus on geopolitical events (especially emerging markets), developments with the Trump Administration (especially on US-China and US-Canada trade, potential legal issues), oil prices, and will turn to reports tomorrow on the BoJ’s Policy Meeting Minutes and Leading Index, German Wholesale Price Index, US House Price Index, Case-Shiller Home Price Index, Richmond Fed Manufacturing Index, Consumer Confidence, and comments from the BoJ’s Kuroda and the ECB’s Praet for near-term guidance.